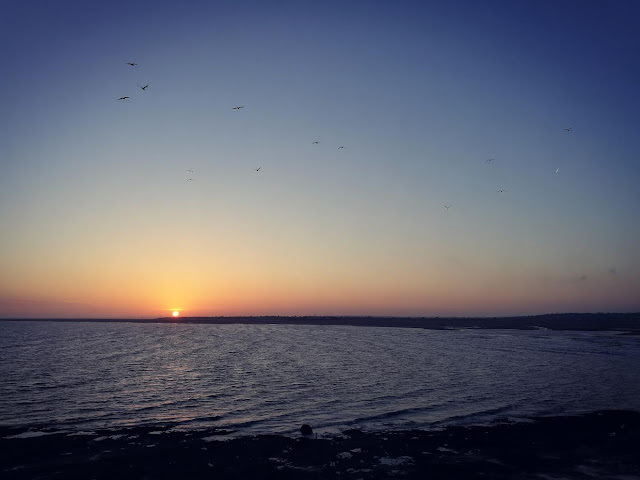 The breeze ruffles the tide edge into ragged waves that start to creep up the Hilbre Swash, a small channel that runs part way along the east side of the island. 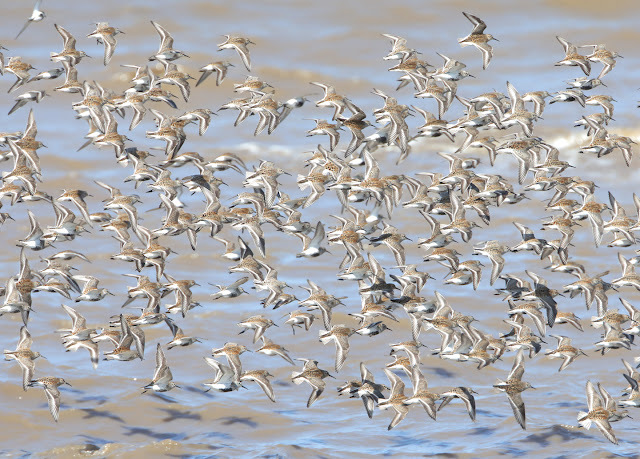 One side of the channel is smooth sand bank where in the high summer hundreds of terns gather. The other side, the island side, is where the sandstone reefs begin. They are a mess of seaweed and barnacles, truth be told you can’t see a whole lot of sandstone close to the swash edge. The crustaceans and vegetation thin out the higher up the shore you climb and that is where I am. I have selected an inconspicuous barnacle free spot to wait in relative comfort for the tide to push some of the Dunlin currently enjoying a feed in the cool waters of the swash, closer to me and in range of my lens. First though I turn to appreciate the sunrise. Always special, even more so enjoying it from Hilbre with the prospect of some shorebird photography on a rising tide. A tiny point of pale yellow light appears above the docks of Liverpool. Above it the sky is graded in many shades of citrus that fade to indigo the further you raise your head away from the horizon to view the sky. 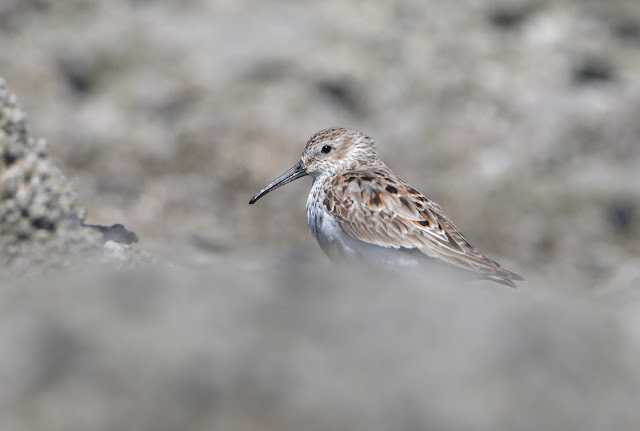 I lower my view to the Dunlin once I have welcomed the day. They are a little nervous, an unsuccessful Peregine attack twenty minutes earlier still has them worried. It failed but they know the predator is still hungry and may return at any moment. A Lesser Black-backed Gull lazily sways and swoops over them and it’s enough to send the flock up in panic. It is a photo opportunity for me while they are too distant for shots of individual birds. They land, closer this time, but still too far away for my purposes. 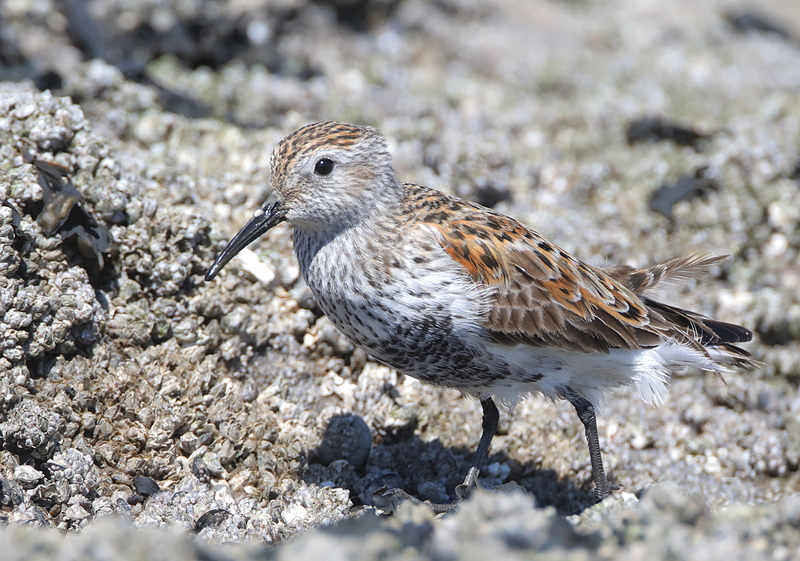 I’ll have to wait a little longer for my pictures of these Dunlin. To my left I spot a movement in a patch of gloopy mud between two reefs. It is darting mouse-like around its muddy puddle. A Ringed Plover. I swing the camera around. Something to have a go at while the Dunnies dawdle at the tide edge. It too is nervous, keeping one eye on the sky in case the Peregrine returns. I always think this species looks worried anyway so it’s expression fits the foreboding of the flock. The mud in its puddle is particularly slack and soft. 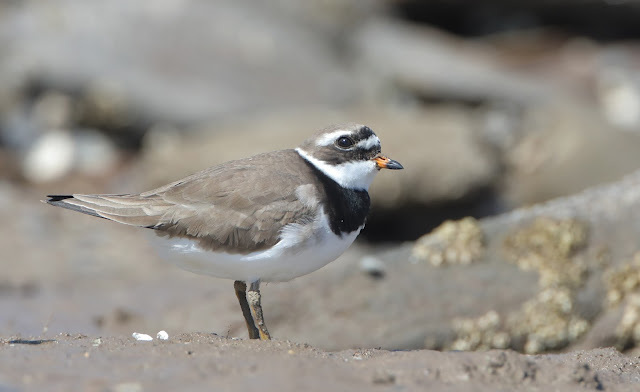 It runs a few paces then stops in usual plover style. After a few seconds its feet have disappeared, sunk into the slop. 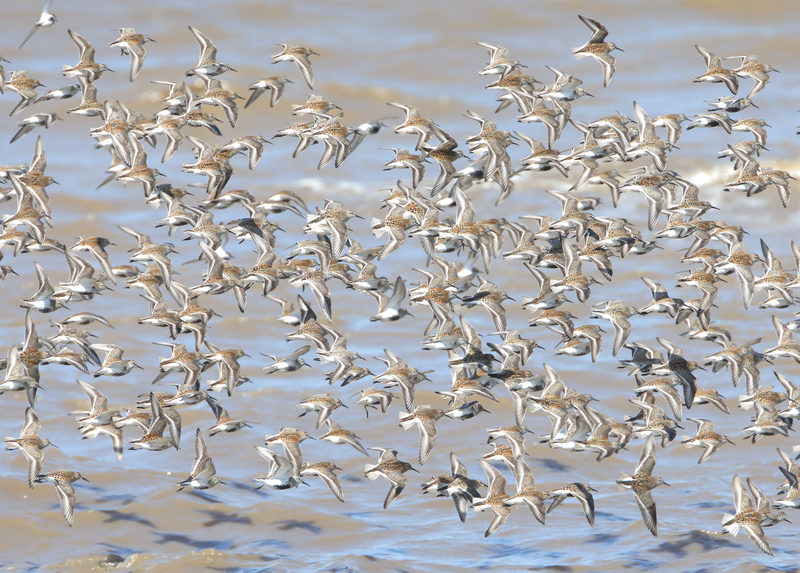 Another movement catches my eye, a little further out this time, between the Ringo and the Dunlin. The tide is rising but it hasn’t yet built the momentum to breach the top of the first reef. The Dunnies remain fixed to the tide edge. 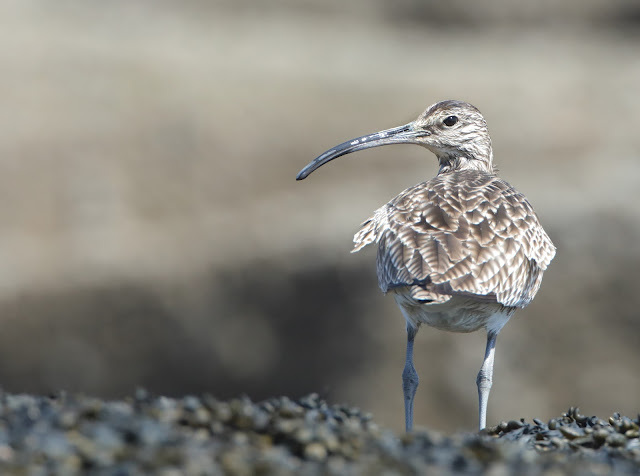 The movement I have seen is a Whimbrel. This is a bonus. There are always plenty of Whimbrel around at this time of year but they are usually very skittish and it is only on chance encounters like this one that you can get pictures. Sitting still for some time I have obviously escaped its notice and it has drifted closer and closer. Another one calls from the other side of the old lifeboat slipway and it looks up, over its shoulder, and takes off heading in the direction of the sound. The Dunnies are still too far away. I won’t go chasing them, I might disturb them and that wouldn’t be fair play, I want to get these pictures with a clear conscience. If I did spook them the pictures would be tainted, I would feel like I’d failed. They may be nice to look at but I’d have a little nagging guilt each time I saw them until I wouldn’t be able to view them at all. I have too much respect for these birds. 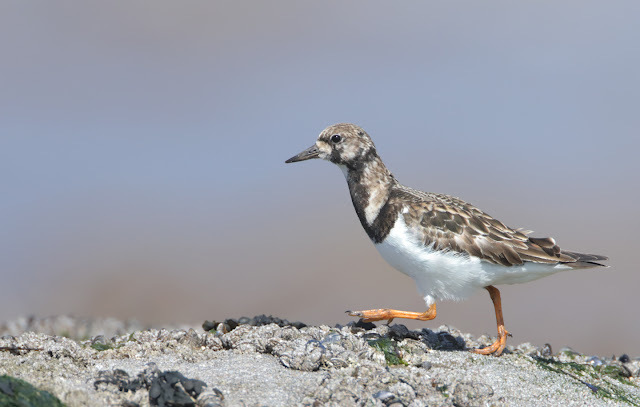 There is just a little something about these long distance migratory shorebirds. What it is I often can’t quite put my finger on. I think of their journeys to and from breeding grounds in the far north… That is it, it is the mystery, the daring adventure. There is a certain romance to their life, so much of it spent unseen, high above us on epic flights or hidden away on inaccessible arctic tundras. Mysterious treeless lands bathed in perpetual light in summer then shrouded in total darkness for months. 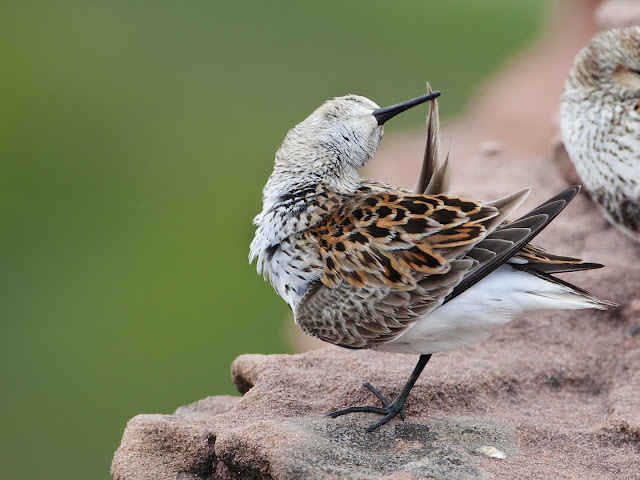 I know in a couple of weeks once these birds have refuelled they will be away from Hilbre, landing in places I can only imagine for now and hope to visit myself one day. All this quiet contemplation while waiting for the birds to get closer is now an essential part of the fun for my photography on Hilbre and the Dee. As is the wonder of imagining where the bird whose image I will look at on the computer screen this evening is going next, where will it nest? How will it do? Will it pass through Hilbre on its way south in the autumn? Questions, mysteries. It is time to stop being so cerebral and to actually get some pictures. Birds are now in range so I snuggle (is snuggle the right word for such an uncomfortable perch?) down into the crevice in the rock I have selected and start shooting. As usual with this plan it all happens very quickly, the tide here can be swift, although with today’s high pressure weather system it doesn’t zoom in with its usual gusto. 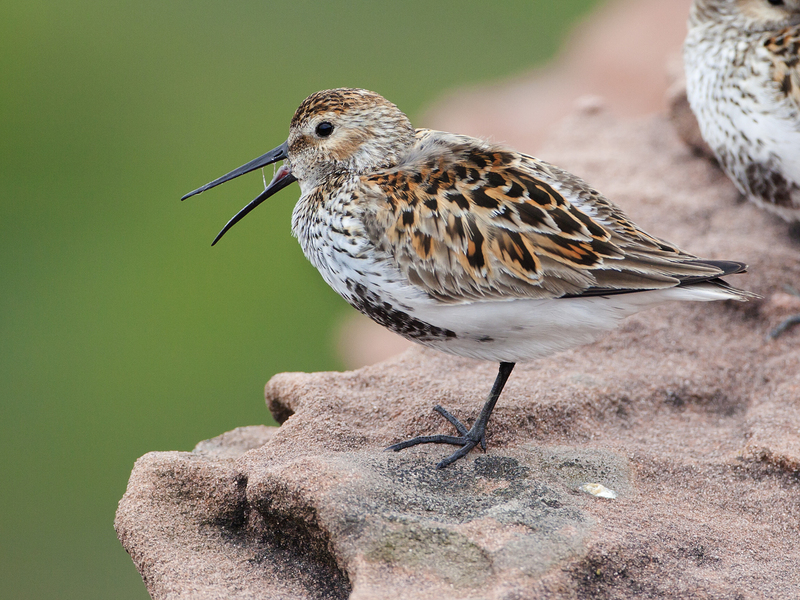 The Dunlin scurry over the rocks, a lone Turnstone whizzes past with them. The camera starts to click with activity after a dormant hour waiting for tide to usher the birds in. I see the Dunnies just being Dunnies. They haven’t noticed me, my drab clothes, unassuming manner and uncomfortable hiding place have seen to that. I can observe their natural behaviour. Some clearly have their minds on the imminent breeding season. Males bump and barge into each other showing off to prospective mates. 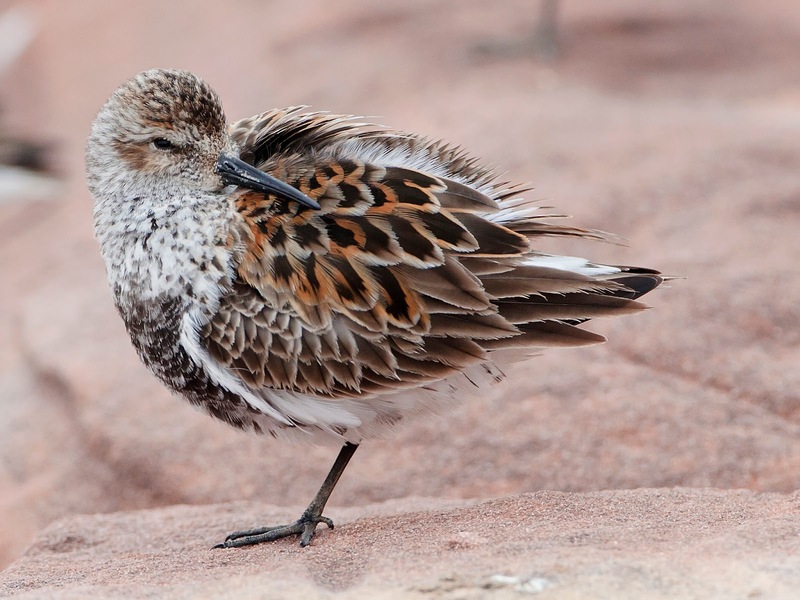 Some are mindful of the miles that lie ahead and spend time preening feathers in preparation for the flight to come. A few decide a rest is required, conservation of energy for the flight seems to be their priority. A handful sing, it is beautiful sound. The show is over in no time. I don’t see what spooks them, it may have been the Peregrine, it may have been a false alarm. Whatever it is all the birds go up in a rush, I don’t feel a whoosh of air from their wings but I expect one, the noise is huge. They twist and turn low over the water and wheel around the north end of the island where I lose them from view. The enigmatic flock. The rocks are silent before me. I don’t move, I remain and sit for a while thinking about the Dunlin until the tide starts to lap at my wellington boots. Only then do I pack up the camera and return to the sanctuary of the island.